Northeast of Peninsular Malaysia, nearby the city of Kota Bharu, there are two small islands that form the Perhentian Islands. The names are Perhentian Besar, the larger of the two and popular among couples and families with children, and Perhentian Kecil, the smaller island and very popular among budget travelers. Both the islands have plenty of accommodation available to stay overnight. This ranges from luxurious resorts that offer cabanas complete with air-conditioning, to simple lodges where you will have to do with cold water and a fan. There are no (internationally renowned) hotels. Perhentian is most popular because the great places for diving and snorkeling; in most cases you can enjoy the underwater world right in front of the resort. It is also very popular because the island is easy to reach; though during the monsoon season (October to March) practically the whole island is closed to tourists. As Perhentian Island is part of a marine park visitors have to pay a conservation fee of RM5. 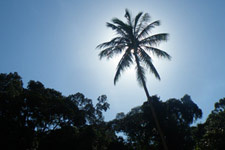 The island is situated about 20 kilometers off the northeastern coast of Peninsular Malaysia. Check out our Perhentian Island picture sets at Flickr.com here and here. First time we went to Perhentian Island left us wanting to come back for more as we did not get the opportunity to really explore the island because of a 5-day diving-course. Years later we have visited the island numerous times. Often visitors of Wonderful Malaysia ask us if we would choose Perhentian Island (or other islands on the eastern side of the peninsula) over islands like Langkawi, Penang and Pangkor on the western side of the peninsula. Langkawi, Penang and Pangkor cannot be compared with islands at the east coast of Peninsular Malaysia, but they all are equally beautiful on their own. 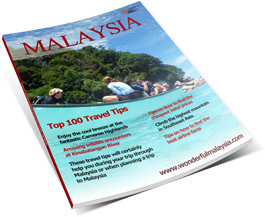 Penang is renowned for its busy, engaging, multicultural atmosphere, Langkawi is known for its beautiful landscape and wildlife and Pangkor is still the quaint island as it was years ago. If you are looking to visit an affordable tropical destination within Malaysia, Perhentian is a great choice. Diving and snorkeling together form the highlights of your visit to the island. The islands of the Terengganu Marine Park are well-known for the stunning clear waters, fantastic coral reefs and amazing marine life. You can stay overnight for RM50 per night, but also for well over RM300 per night. If you want to experience that ultimate tropical feeling during your visit to Malaysia, Pulau Perhentian is the perfect place. When we visit the island we usually try a number of different restaurants to avoid eating at the same place every night but also to get a good impression of the food on the island. We found out that food overall is pretty good on the island, though prices did go up a bit over the years (still very affordable). 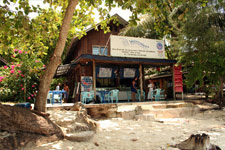 For example; the simple restaurant in front of the basic Paradise Resort (Perhentian Besar) was a great place to eat. Most tourists shared our views as the restaurant was packed every evening. The food was tasty and very affordable. Also, there was plenty of choice and the service was excellent. The restaurant of the Coral View Resort for example also offers good meals; furthermore, there is a splendid view of the bay right in front of the resort. We did also enjoy a good meal at Tuna Bay Resort; but we did notice all the other resort guests preferred western food over the delicious local cuisine. Local dishes are often influenced by the Thai cuisine (this goes for the local dishes in the whole Kelantan area). We especially enjoyed the Black Pepper Beef, Singapore Style Bee Hoon and the Daging Merah (around RM18 per dish). Most local restaurants also serve western meals; for example the lunch menu contains popular meals like BLT, burger with fries, club sandwich. Often there also is an extensive smoothie and mocktail list (around RM10 per drink). In most restaurants there is also a cocktail menu (with of course many other alcoholic beverages). On both Kecil and Besar there is no real party scene. If you are searching for something that can be considered as nightlife; you are best off at Perhentian Kecil. Perhentian is an ideal place to get your scuba diving license. There are various diving schools on the island and the sea conditions (visibility and currents) are usually perfect for beginners. In Malaysia, you will pay around RM1100 for your PADI license, considerably cheaper than in many other parts of the world. If you plan on getting your PADI, you will have to stay on the island for at least 5 days. On the island Perhentian Kecil there are a couple of great diving schools along the famous Long Beach and Coral Bay; Sunlight Divers, Quiver Dive Team, Turtle Bay Divers, Seadragon Divers, Matahari (formerly Coral Sky) Divers, Spice Divers and Angel Divers. On Perhentian Besar the diving schools Flora Bay Divers, Watercolours and Sea Horse Divers are also of high standards (among others). 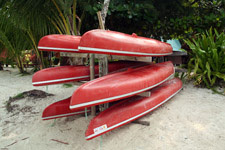 Flora Bay is a 5 Star Gold Palm Instructor Development Centre. 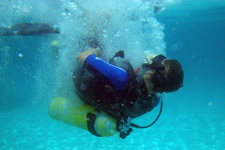 Sea Horse Divers is located right next to Tuna Bay Resort, which is just about the most luxurious resort on the island. We got our PADI at Watercolours, which is located next to the basic Paradise Resort and within walking distance of Coral View Resort. 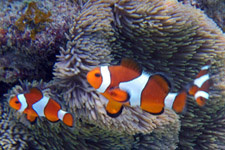 Watercolours is a diving school with excellent instructors and a friendly atmosphere. The food at the diving school is perfect, as you will be eating at the restaurant of Paradise Resort (a very popular local restaurant that also servers great western dishes. 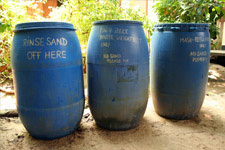 Watercolours organizes regular reef and beach clean operations; all based on the Reef Check survey methodology. Visitors become more aware of the fragile state the corals around Perhentian are in and they actively help to monitor and conserve the marine environment during their stay. Within walking distance of Watercolours Dive School there is an amazing snorkeling site with barracudas, black reef tip sharks, humphead parrotfish, cuttlefish, blue spotted rays and green turtles. This great location, Teluk Pauh, is right in front of the Coral View Resort as well as in front of the Perhentian Island Resort (PIR). Right in front of the beach of PIR there is a small strip with underwater sea grass where green turtles go to for food. The chance of spotting a turtle over here is very big. We have been there many times and there wasn't a time where we did not see a turtle. Sometimes you do have to be patient and do not get to close to the small jetty. The area where the turtles can be seen is marked by white floaters. Between October and March the monsoon season puts all tourist activity at the eastern side of the peninsula to a complete stop; as this monsoon is very heavy. Most resorts at the Perhentians are closed during these months and the ferry service between the island and the mainland is also halted. Sometimes monsoon starts a bit earlier, other years much later. 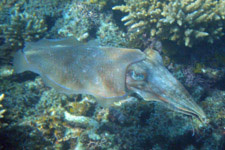 Best time to the year to visit the island is during the months of August and September; during these months the conditions under water are usually perfect (great visibility). During those months it is usually also very crowded on the island; you clearly notice that it is peak season. If you want to enjoy secluded beaches then you should visit the island from April to June. 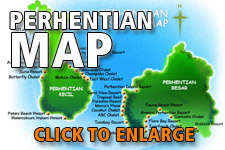 During your stay at Perhentian you will notice that you are somewhat limited in your options to get around. There are numerous 'strips' with a couple of resorts next to each other. It is not easy to walk between those areas; only certain parts of the island are connected by walkways. Perhentian Besar has a path that crosses the island, but this is more a jungle walk then an easy way to get from one side to the other. There are no roads and therefore no motorized traffic on the island. Most common form of transport around the island is by water taxi. Almost everywhere you will see locals with a small boat and for a small fee they will bring you to other areas on the island. You can also arrange a drop at a secluded beach, and a pickup later that day at a time you both agreed on (don't forget to bring enough sunscreen and water). On both the islands there are a number of hiking trails, there are no roads however. The trails are light and usually don't take more than 30 minutes to complete. Perhentian is too small to spot real wildlife, but there are monitor lizards, monkeys, fruit bats and some species of birds on the island. Because walking in the heat is not very pleasant for many, you can take water taxis to return to your resort after the hike. When going to secluded locations, come to an agreement on the pickup for the return trip. 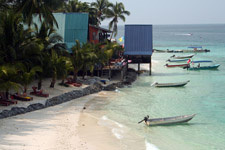 Perhentian is famous for its great snorkeling possibilities. A lot of resorts on the island have their own house reef; this means that you can snorkel directly in front or within walking distance of your resort. On the Perhentians there are dozens of diving schools. There, you can rent diving goggles, an air tube and flippers for a small fee (usually around RM15 per day). With this equipment you can snorkel in front of your bungalow. Sadly the fish in front of the resorts often are very spoiled. This means that, as soon as you are in the water you will be surrounded by small (and sometimes also large) fish that expect you to feed them. Also, the coral reefs near the resorts usually are less beautiful, because boats regularly pass by to drop people off at the resort. 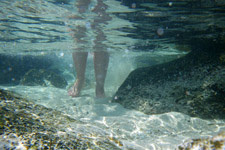 You can also visit some of the secluded beaches yourself with a sea kayak. In that case it is wise to bring along a so called 'aqua bag' where you can put in your valuables when you are kayaking (so they don't get wet). Do know that only a small trip by kayak can already be very strenuous; but it is very rewarding as there are many fabulous beaches waiting to be explored around Perhentian. Remember to get out of the kayak before going ashore. We made the mistake of staying in the kayak and didn't anticipate on the waves that day. As a result we were slammed onto the beach and almost lost many of our belongings (luckily we had the aqua bag). 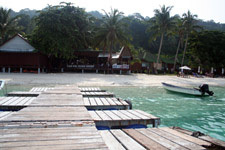 Many tourists visit Perhentian Island to enjoy a couple of great dives. As there is fierce competition between operators diving at the island is relatively cheap, usually ranging between RM60 and RM80 per dive. 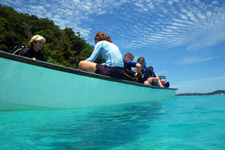 Diving at Perhentian is especially for beginners as there are almost no currents and visibility is almost always fine. There are better places to dive in Malaysia, but almost none of them are so affordable and easy to reach as on Perhentian. There are many great resorts on Perhentian Island. Prices range from cheap (around RM50) to pretty expensive (RM300+). We have stayed at some nice places; Tuna Bay, Coral View, Bubbles and Paradise (all on Perhentian Besar). We especially like Coral View because of the distance to the great snorkeling bay; Teluk Pauh. 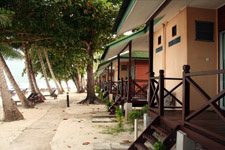 We stayed at Bubbles Resort; which is located at a more secluded part of the island. We very much liked the atmosphere over there plus snorkeling was really great (huge black tips and many turtles). Tuna Bay used to be very pleasant, but has now become a very popular resort. It attracts many people and it is almost always fully booked. We did like our sea facing cabana though; the overall atmosphere is always very nice (and when we were there they served great local and western dishes). 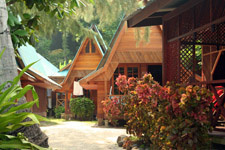 Nowadays, Tuna Bay is also pretty expensive compared to most of the other resorts. Almost every resort has a nice restaurant with local and foreign dishes. The resorts also offer wireless internet (or at least a pc that you can use for a small fee). Over the years Perhentian Island has become increasingly popular among tourists. During peak season, June to September, resorts often are fully booked. Especially when you have a certain popular resort in mind to stay at, you need to reserve a cabana beforehand to make sure it is available for you on arrival. Most of the popular resorts only accept a reservation after payment is done. Many resorts only accept payment via credit card. Unfortunately this doesn't work over a secured connection like any normal web shop (although some of the resorts offer this option via their website). Perhentian Island Resort , Bubu Long Beach , Bubbles Dive Resort and Arwana Eco Resort are the only resorts where you can make reservations beforehand via hotel websites (like Agoda.com or Booking.com where we usually make our reservations). Resorts that do not offer an online solution to make reservations use the old fashioned (unsecured) way; you have to send your credit card details via email of fax to the resort. After they get all the details they will confirm the reservation. Some tourists find this a very unpleasant way to make reservations; unfortunately this is the only way available. You could always just drop by and see if there is anything available. This certainly is the way to go for the more adventurous kind of traveler. Usually there is always something (basic) available at Perhentian Kecil. If everything is fully booked during the time you are visiting Perhentian, try and find out which resorts are located in walking distance of each other. Sometimes you can just switch from resort to resort a couple of times; which to most travelers is not a big thing. That way you can still stay at the island, but you just move from one resort to the other. The area around Coral View is especially nice as there are numerous small resorts located right next to each other. Same goes for the resorts along Long Beach and Coral Bay at Perhentian Kecil; here too should be enough accommodation available so you could take a gamble and just go there without any reservations up front. Resorts like Tuna Bay, Adbul Chalets and Coral View at Perhentian Besar often are fully booked during peak season as they are especially popular among families that travel with children. The more remote the resort is located; the better the chance of an available room. Don't book a full board package, unless you are on a diving trip (or doing a PADI course) as it is often easy to just eat wherever you want (usually there are many places to eat in the area). Some resorts are located at a remote part of the island, where you will not have many other options then to eat at the resort every day. When traveling from Kuala Besut to Perhentian, boat operators almost always charge the same price; there is no point in waiting with the reservations. You avoid having to go through all those small shops to get tickets; instead you can just print the voucher beforehand and immediately hop in the boat upon arrival at Kuala Besut. Make sure you arrive at Kuala Besut well before 4pm (last boat to Perhentian departs around 5pm). Backpackers or low budget travelers should head over to Perhentian Kecil is there is far more basic accommodation available on that part of the Perhentians. The state that Perhentian is part of is not that fond of public drinking of alcohol. Muslim-owned restaurants on Perhentian are not allowed to sell alcohol. This means some restaurants do sell beer and other alcoholic beverages; others do not. You could always consider bringing your own alcohol to the island; especially if you have visited Langkawi or Tioman before traveling to Perhentian (both are duty-free islands). If you are going to do some diving or snorkeling; you will need diving goggles. If you are wearing glasses it would be great to have powered lenses in your mask, but unfortunately almost none of the diving schools at Perhentian have those. Luckily you can buy them beforehand at the Midvalley Megamall dive shop in Kuala Lumpur for only RM179. They are ready made, so you only need to find out the needed correction (just drop by a store where they sell glasses and have it measured for free). To travel to the island you will have to take the bus, train or airplane to Kota Bharu or Kuala Terengganu (quickest way is via Kota Bharu). There are daily flights to both cities (Malaysia Airlines, AirAsia and Firefly). The bus is by far the cheapest way to get from Kuala Lumpur to Kota Bharu. From there on, you can take a bus or taxi to Kuala Besut; where the ferry to Perhentian departs almost every hour. The taxi is the easiest but also the most expensive method of transport to Kuala Besut (RM70 from Kota Bharu, RM110 from Kuala Terengganu). There are also minivan services from numerous popular places to Kuala Besut; for example NKS in Taman Negara arranges transport from this national park to Kuala Besut. Similar operators offer transport from Cameron Highlands to Kuala Besut. The real adventurous travelers might like the 'Jungle Train' between Gemas and Kota Bharu. Stops nearby Taman Negara are Jerantut & Kuala Lipis so travelers can easily combine both a trip to this popular national park with a train ride to Kota Bharu in order to visit Perhentian Island. Some describe this trip as really basic, where even the 1st class sleepers are in poor state. Nonetheless, the experience is great and you will not see that many other tourists taking this route to Kota Bharu. Kuala Besut is about a one hour drive from Kota Bharu (and 2 hours from Kuala Terengganu). At the small harbor it is possible to buy tickets for the ferry. We always pay RM70 per person for a return ticket. 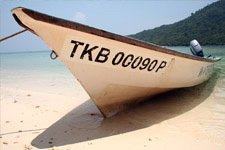 There are various ferry operators that provide a service to the island; often connected to one or more resorts on the island. The ferries depart several times a day; the last one leaves Kuala Besut around 5pm. It is advisable however to take an earlier ferry. The ferry usually takes about 40 minutes to travel from Kuala Besut to Perhentian. Because the ferry usually transports around 15 to 20 persons, you will most likely spend quite some time getting all the people to their resorts. In case of bad weather the boat will not leave. Unfortunately the locals may have a different definition of bad weather then we do. We travelled to the island once around 4pm; just ahead of a heavy storm. This was not a pleasant trip. It is better to take the boat at Kuala Besut in the morning or early afternoon. The weather conditions then are usually better, and it is also less busy, so you won't be traveling on a crowded boat. Also, there is some difference between operators; some fill a boat easily with 20 people and their luggage, other have a 10 person maximum. We traveled once with the big Tuna Bay ferry; it was the most pleasant ferry trip so far.